Master the basic table tennis serve. The table tennis serve is the most important stroke in the game because it provides the only situation in which you have total control over how and where you play the ball. 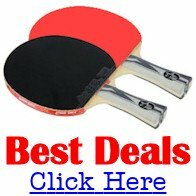 However, before you can master the correct table tennis serving technique, you'll need to ensure that you're using the correct table tennis grip and that you've mastered the four basic table tennis strokes. Note: This technique is just a training aid. It is not a "legal" serve. 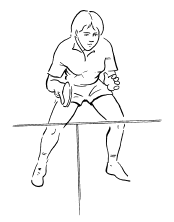 On your backhand side, position yourself at the side of the table, halfway between the net and your end of the table. 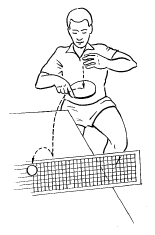 Hold the racket at an open angle - as if you were going to play a backhand push - and with your free hand, hold the ball between your thumb and first finger at a height of around 30cm (12 inches) directly above the racket. Without moving your racket, drop the ball onto it so that the ball is projected towards your opponent's side of the table. The ball must first bounce on your side of the table and then go over the net and bounce on your opponent's side of the table. Repeat this several times until you're consistently successful. Once you've mastered this technique standing close to the net, gradually move further away from the net, nearer to your end of the table, and repeat the exercise. As you move further away from the net, you'll need to play a forward stroke action with your racket to give the ball enough momentum to get over the net. 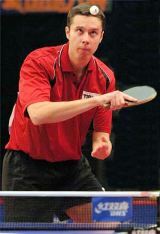 Once you've mastered the basic table tennis serving technique, you'll need to learn how to serve in accordance with the official laws of table tennis. Balance the ball in the palm of your free hand and project the ball upwards, as near vertically as possible, so that it rises at least 16cm (6 inches) after leaving your hand. Allow the ball to drop and then hit the ball with your racket - using the stroke technique you mastered earlier - so that it bounces on your side of the table and then goes over the net and bounces on your opponent's side of the table. When you've mastered this, you'll be able to produce a legal serve. Simple. The return of serve is regarded as the second most important table tennis stroke because it's the first opportunity for you as the receiver to play the ball. In preparing to return the service, you should take up the ready position (as explained in the following video). As receiver, you should try to vary the direction of the return by making good use of the available angles and lines of play. To force a weak return from your opponent, play your shots to their crossover point. The crossover point is the area in which the player has no obvious choice of forehand or backhand. For a right handed player, the crossover point is roughly in line with the right hip.